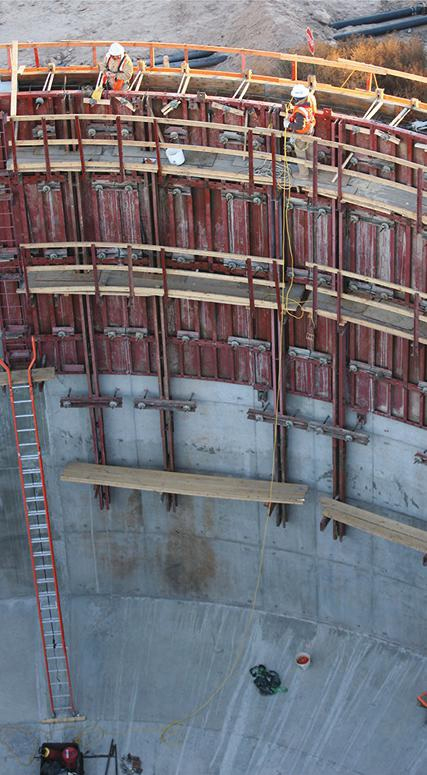 A little over 10 years ago, utility owners (owners) were beginning to see proof that construction management at-risk (CM at-Risk) can be a very cost-effective delivery method for large-scale water infrastructure projects. 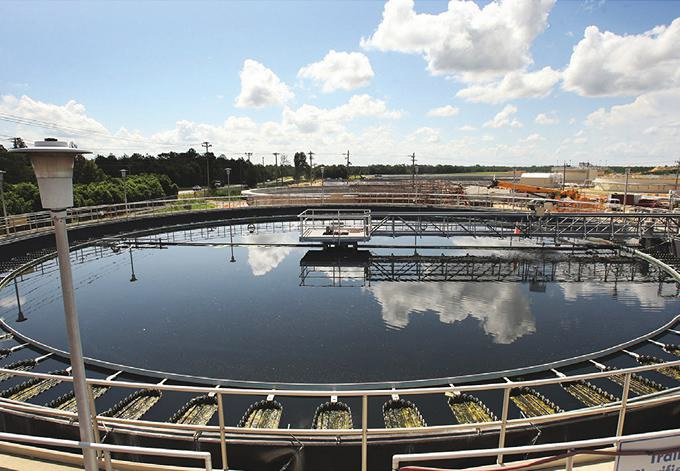 In 2009, the U.S. was coming out of a significant recession, and owners were looking for innovative, cost-effective ways to accomplish their water and wastewater facility expansions, upgrades, and new plants. The CM at-Risk delivery method, which entails development of a guaranteed maximum price (GMP) and a commitment by the construction manager to deliver the project within that price, includes a higher level of cost certainty from the beginning. It also limits the owner’s risk, provided the construction manager at-risk (CMAR) has a good understanding of the project and has built the proper allowances and contingencies into the GMP. In 2009, MWH Constructors (MWHC) was nearing the end of a nine-year, $1 billion utility and facility program for the City of Cape Coral, FL, that included 700 miles of pipeline, 34 pump stations, three water reclamation facilities, and a reverse osmosis water treatment plant. MWHC designed and delivered the facilities using a hybrid design/CM at-Risk delivery method. By 2010, with nearly $2 billion of CM at-Risk work already in their portfolio, MWHC was still learning what it takes to be a successful CMAR. Today, more than 70 percent of MWHC’s jobs are CM at-Risk. Incorporating lessons learned and structuring their processes and their organization to focus on alternative delivery, the complex CM at-Risk projects they completed between 2010 and 2014 set the stage for where they are now and where they want to be going forward. 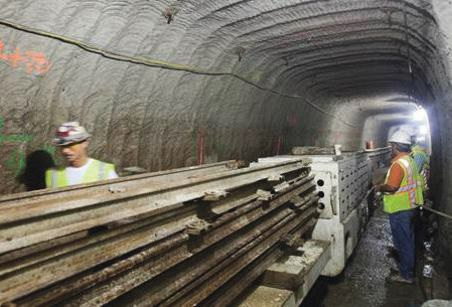 Important to their success, MWHC developed a knowledgeable and talented staff of project managers and superintendents early on, implemented a rigorous safety program, and leveraged value engineering (VE) to save millions of dollars for clients. Also imperative is a full understanding the owner’s goals and the willingness to do what it takes to satisfy those goals without increasing the budget, adding time to the schedule, or sacrificing the owner’s desires. A construction firm that predominantly operates in the traditional hard-bid method of contracting may struggle with the realities of the partnering relationship required to make the most of the CM at-Risk delivery method for the owner. Figure 1. 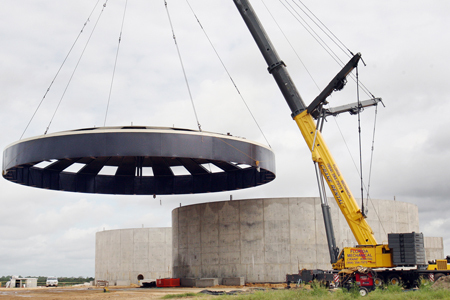 The city of Austin’s $374 million WTP4 Water Treatment Plant project included a new 50-MGD plant (expansion to 300 MGD), a 300-MGD lake submerged intake, and two 9- and 7-ft diameter raw water tunnels. The project was awarded numerous awards for innovation and quality and included LEED silver-rated administration and maintenance facilities. On a CM at-Risk project, the CMAR develops a critical path method schedule early in the design phase that serves as the master schedule and links each of the project’s design, preconstruction, and construction activities. This is updated weekly throughout the project’s lifecycle and monitored frequently. MWHC often uses digital delivery and 4D Building Information Modeling (BIM) to verify things like site logistics, yard operations, and temporary facilities. As the design changes, the model automatically identifies the changes and their respective impact on the critical path and overall delivery of the project. Utilizing 5D BIM enables the CMAR to monitor the project’s construction cost throughout the design, rapidly generating an array of essential estimating information, including material quantities and costs, size and area estimates, and productivity projections. Close collaboration with the design team and the owner’s operations staff enables successful process tie-ins and plant shutdowns, when needed. At various stages of design completion and throughout preconstruction, it’s incumbent upon the CMAR to not only understand what the owners want, but to work with them and the design engineer to satisfy the owners’ desire to keep everything they originally asked for without paying for more than they budgeted. At this point, it’s important to have knowledgeable engineers and construction personnel on staff who can develop and implement innovative VE and constructability suggestions to cut costs without eliminating important features. Figure 2. Pima County’s $232.5 million WRF expansion project included a 50-MGD liquids and solids train replacement and construction of a 37.5-MGD five-stage Bardenpho treatment process. MWHC developed 450 MOPO (Maintenance of Plant Operations) plans and successfully completed over 250 mechanical tie-ins and 350 electrical switchover ties without incident. If estimates start to reflect increased costs over budget, an experienced CMAR can lead a VE workshop with the owner and the design engineer to identify areas of potential cost savings. MWHC conducted such a workshop on the City of Tallahassee’s $172 million Water Reclamation Facility (WRF) project, identifying $50 million in savings and bringing the project back to budget. It’s sometimes a challenge to reduce the costs to the original levels, but an experienced CMAR should be able to get the cost down to a budget the owner finds acceptable. Constructability reviews as the design progresses are also critical for maximizing value through collaboration as they serve to uncover issues that can be dealt with ahead of time instead of later during construction when they might add cost or delay the schedule. As the phases in a CM at-Risk job progress, responsibilities shift, and success depends on all parties having a comprehensive understanding of the delivery method and the inherent advantages and disadvantages. Figure 3. 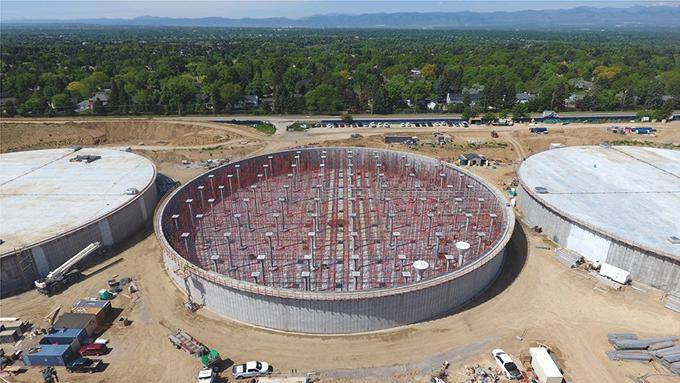 As CMAR on Denver Water’s $100M Hillcrest Reservoir Basin and Pump Station Replacement project, MWHC is replacing a 115-MGD pump station and removing two conventionally reinforced concrete storage basins with a combined capacity of 30 MG and replacing them with three new circular, prestressed, tendon-type concrete basins with a combined capacity of 45 MG. MWHC added value to the project by reviewing and evaluating costs, constructability, schedule, and implications of alternate designs. Currently under construction, the Logan Regional Wastewater Treatment Facility had an initial owner’s estimate of $107 million. When the MWHC team performed its own estimate, however, the figure was significantly higher at $171 million — an estimate proven accurate by subcontractor and vendor pricing for the work to be completed. Knowing they needed to find a way to bring the cost much closer to the City of Logan’s original estimate, MWHC conducted an intensive weeklong VE/constructability workshop, collaborating with the owner and design engineer, as well as additional MWHC experts brought in from across the country. The results included more streamlined work sequencing, changing driven steel piles to auger cast piles, and deletion of the influent pump station, for a final GMP of $136 million. The next step involves developing the GMP and open-book negotiations. If owners only have experience with hard bids and lump-sum design-build, they may struggle to understand portions of the transparent, detailed cost information and why certain costs should be allowed. Even though a hard bid includes fee and contingency, for example, owners never see that breakdown. There are many advantages to the owner when it comes to transparency, including the fact they may never have to spend the contingency. Some owners may even choose to incentivize the CMAR by offering to share the unused contingency at the end of the project. These negotiations will often distinguish between an experienced CMAR firm and a firm that more typically performs projects utilizing the traditional hard-bid method. Figure 4. The City of Tallahassee needed a more efficient enhanced nutrient removal process to meet new environmental regulations. As CMAR on the $172 million project, MWHC provided preconstruction, multiple GMPs, and the complete construction of facility upgrades and project closeout. It’s also important to have experienced, specialized estimators who can produce accurate estimates from conception to completion. Understanding how to tailor bid packages to local market conditions and ensure maximum subcontractor competition drives cost savings for the owner and supports the community at large. Even when self-performing a large percentage of the work, a good CMAR will provide the owner with a detailed, production-level estimate for each bid package they wish to perform themselves. They will also select a minimum of three bids from prequalified subcontractors for each bid package as a method of evaluating their own pricing and ensuring the owner receives the best value. In the case of CM at-Risk delivery, it’s critical the owner selects the most experienced CMAR with experience in performing similar, relevant CM at-Risk work. The value an experienced CMAR provides to the owner includes higher cost certainty, faster delivery, less risk, and lower costs. Blair M. Lavoie, PE, is president and CEO of MWH Constructors, a top-tier, global construction company in the water and wastewater industry. Lavoie also provides direction and leadership to Slayden in the U.S. and MWH Treatment in the UK. Lavoie graduated from Harvard’s Advanced Management Program and Norwich University. He has been instrumental in shaping the construction industry’s adoption of alternative project delivery models, such as progressive design-build and CM at-Risk.